I dimly remember Andy Goldsworthy from when I lived in the UK, perhaps through that veritable institution Blue Peter, but his work didn’t connect with me at the time. 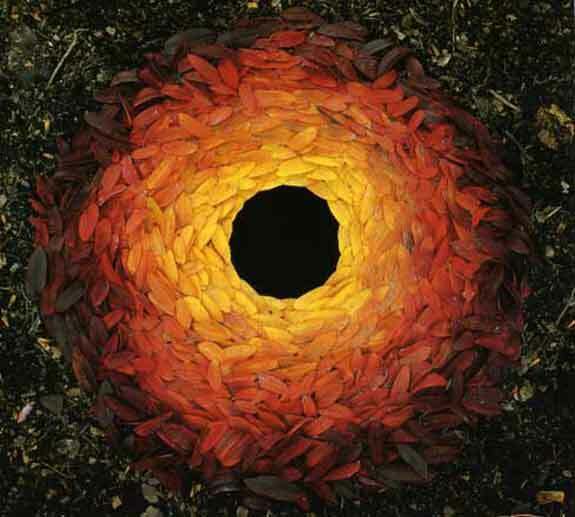 I recently rediscovered Goldsworthy through his book, Time, that I found when I was browsing in a bookstore – remember those? Andy Goldsworthy is a ‘land artist‘, a sculptor who uses the elements of nature as the materials for his sculptures. There seems to be a balance between the permanent works done with stone and the more ephemeral sculptures made with fallen branches, leaves, and ice. Thinking about his more transitory work made me think harder about why I photograph, I’m not sure that I would be happy to see my constructions disappear as the weather changed or the tide changed. Perhaps the change that ensues is part of the process and that seeing how the work develops with time is as satisfying as it was to make in the first place. It was interesting to see Goldsworthy working in the field and to realize how close to the edge he operates. Many times it seems as though he could be 2/3rds of the way into making a work and it collapses, not once but over and over again. I hardly think that I would have maintained my composure in the face of such frustrations as Goldsworthy manages. Persistence clearly wins the day. Check out the videos below to see what I mean. If you’ve gone through the exercise to unearth you why or crafted a mission statement you should have a better sense of what is important to you. So here’s a question, how much of the stuff in your life actually supports your mission, actively contributes to what you’re trying to achieve? How much is left over commitments to old hobbies that lost their luster a long time ago. This can be true on multiple levels, physical and emotion. Patterns of behavior that don’t fit with who you want to become, to what you want to achieve. Fortunately with your newly crafted mission it’s easy to edit the things in your life so that everything that you do points you in a forward direction. Starting this editing process can be overwhelming but it needn’t be. You just have to start. Start by taking an inventory of your commitments. What still fits what doesn’t. Bow out gracefully from those things that are taking time away from what you’d rather be doing. Think about what you should be adding that will move you towards your goals. Finding a supportive community to share your work with and receive feedback from can be an important step forward for any artist. Reducing the physical clutter in your life can be remarkably freeing and result in bursts of creativity. This can be a simple as taking 10 minutes to work on a specific area – your desk, the kitchen counter could be good places to start. Places where you have to move things around before you are able to start working are strong indicators of the need to optimize that work area. Take stock of the things that come into your life – magazine subscriptions from discarded hobbies are a major source of clutter for me, not dealing with the mail as it came in also overwhelmed me when I first moved to the US. Books can also be another problem for some, clothes for others. Removing these distractions to free up space and time to focus on the things that are important will have a meaningful impact on moving you towards your goals. 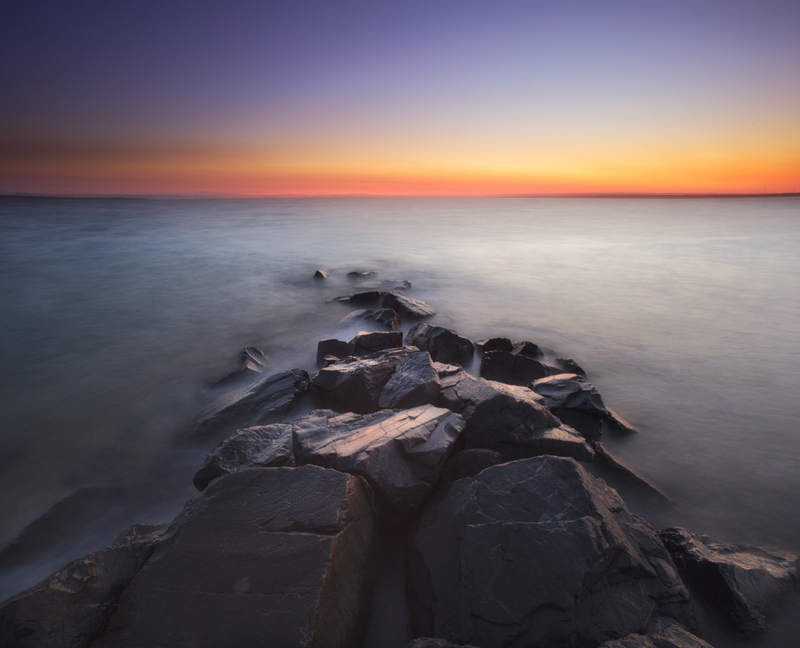 I’ve been interested in figuring out how to give my images a sense of space, a feeling that you could step into them, and how I can play with time. I feel as though I’ve been making progress – using different kinds of lenses to get different effects and playing around with long exposures to give effects that can’t been seen. Somewhat naively I thought that this was my unique struggle and so in digging into David Hockney’s work I was interested to read that he was wrestling with the same issues – 30 or 40 years ago. 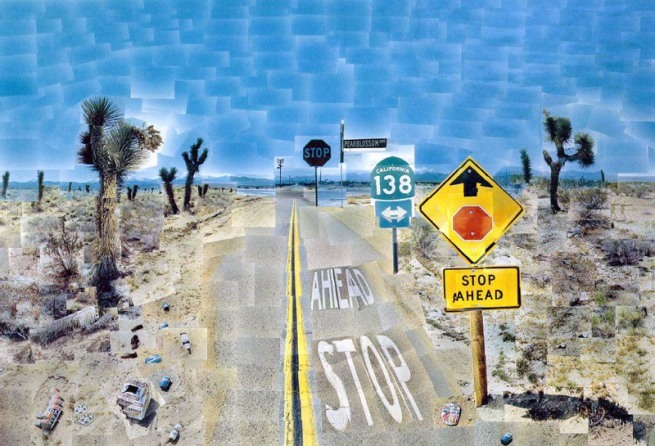 Hockney’s solution was the creation of photocollages. Perhaps the most successful of these was Pearblossom Highway, the image at the top of the page. When I had originally seen this and others like it I had thought that these were quite simple, knocked out in a couple of minutes. I didn’t realize the thought and effort that went into the making of it. Apparently the original shoot was done over the course of 8 days and then the assembly of the collage took another 2 weeks. What makes this image interesting for me is that it plays with the notion of one point perspective that you would normally have in a photograph. This is done by changing position for each of the major elements in the photograph, for instance getting up on a ladder to shoot the stop sign. It gives an interesting effect. In other collages photographs of his friends and family taken during the course of an evening or afternoon capture their personality and the action. I’m not intending to begin photocollages, just yet, but certainly food for thought.